On the heels of the legendary Peter Rowan's latest tour in Europe with Red Wine (I) and Druha Trava (CZ), Compass Records announce that Rowan is currently in the studio working on his upcoming Compass album The old school, scheduled for release in spring 2013. On this album Rowan delves further into his bluegrass history with a cast of musicians including some of the first bluegrass generation, who really know 'the old school'. 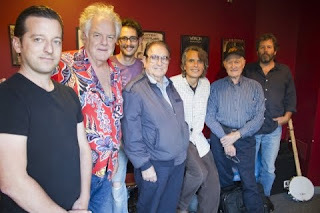 The photo above shows him (in Hawaiian shirt) with Bobby Osborne and Jesse McReynolds as well as Keith Little, Paul Knight, and Mike Witcher from his own band and Jason Carter of the Del McCoury Band. Bryan Sutton, Michael Cleveland, Jeremy Garrett of the Infamous Stringdusters, and Chris Henry are also taking part. Compass Records has released a 'teaser' preview video which can be seen here. The full press release can be seen here.